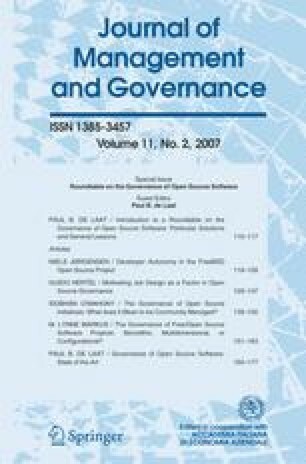 The governance of open source initiatives: what does it mean to be community managed? The concept of ‘open source’ software initially referred to software projects managed by grassroots communities in public forums. Since 1998, the concept has been adapted and diffused to new settings that extend beyond software. While the open source community has maintained control over which software licenses can be considered ‘open source’, little attention has been paid to the elements that constitute community management. More private parties now contribute to OSS communities and more hybrid governance models have emerged. Before we can understand how hybrid models differ from a community managed model, a more precise definition is needed. This essay takes a step in this direction by identifying five core principles critical to community-managed governance. Thanks to Joel West, Sonali Shah, Mitch Kapor, Mitchell Baker, Brian Behlendorf, James Howison, and Kevin Crowston for their comments on this paper and these ideas. Thanks also to the reviewers and editors for their helpful comments. Gladwell, M. (2005). The bake-off. The New Yorker, September 25. Retrieved March 7, 2007, from http://www.gladwell.com/2005/2005_09_05_a_bakeoff.html.